Computer science is widely considered and regarded as being one of the highest paying specializations that a student can choose to learn in university. However, since it’s a very broad specialty to study and learn, an average computer science salary may vary from a decent one all the way to a hardly-believable one. With so many different variables impacting the amount of money computer scientists get paid (profession of choice, experience in the field, region of residence), many different numbers start popping up here and there, and it seems almost impossible to get a simple, straightforward answer. However, that’s exactly what we’ll try to do in this article. First of all, I’ll briefly tell you about computer science and why it’s considered to be as profitable as it is. We’re not going to go into any specific detail, but some information is essential if we want to be on the same page later on when we’ll be talking about the actual computer science jobs salary. According to internationalstudent.com, computer science is the “third most popular major amongst international students coming to the United States”. This, in itself, is a major statement when it comes to the popularity of this specialty. But what attracts all of these people to learn and study computer science? First of all, it’s the computer science starting salary. It is quite widely known and accepted that the average computer science salary for people who have just finished their studies or courses is exponentially high when compared to most other professions out there. The computer science salary has actually become somewhat infamous – most online articles that talk about this specialty emphasize just how good the pay is, even for people who have just graduated and are looking for their first job. Additionally, people see genuine future perspectives in the field of computer science. As time goes on, more and more of our everyday lives are being computerized. Naturally, with increasing computerization, there’s a high (and ever-growing) demand for professionals in the field. With this up-aimed trend, it’s highly unlikely that the appeal of computer science might come down any time soon. Finally, a reason that is probably just as important (if not even more!) as a high computer scientist salary is that the field of computer science is very wide and flexible. You could basically say that “computer science” is somewhat of an umbrella term – it encompasses a very wide variety of professions, starting from IT specialists and software developers all the way to game creators and computer hardware specialists. Since there is a big pool of activities to choose from, computer science attracts a whole different lot of people. As I’ve mentioned in the previous chapter, computer science is a really multi-layered specialization. Many companies that are searching for employees that would have majored (or learned in some other way) computer science require somewhat specific specializations. Let’s take a quick look at some of the main branches of the specialty that offer the best average computer science salary. Software engineer. Now, don’t mix this profession with software developers! A simple way to know the difference is that software engineers can also be software developers, but software developers cannot be software engineers. These are two very different functions.Software engineers are concerned with the engineering aspects of the software creation process. If you have majored in computer science and want to apply your diploma to a job related to software while also getting a great computer scientist salary, then software engineering is the way to go. Data analyst. Data analysis requires a lot of skill, both when it comes to using particular software that get the job done and understanding how the field correlates with machine learning and AI technology, in general. Needless to say, a data analyst career path offers an amazing computer science starting salary. Web developer. Although this is quite a specific job title, people who study computer science have the option to branch off and choose to study web development. 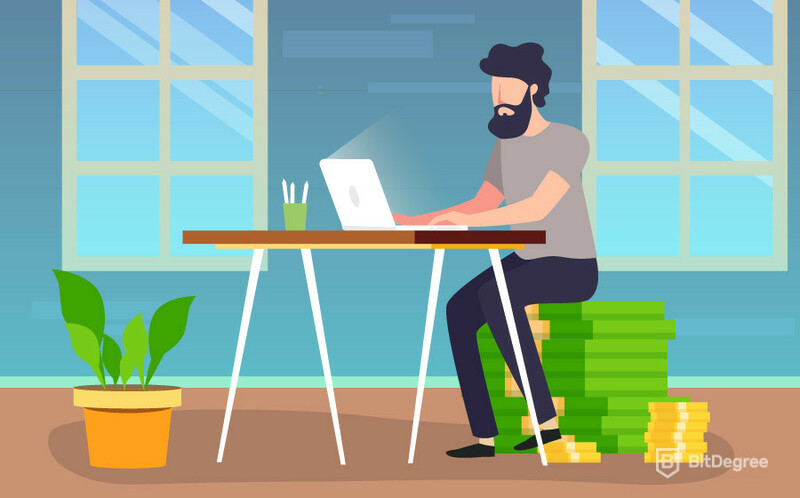 If a person does choose the path of becoming a web developer, he or she might get an additional bonus to his computer science salary (since he would also be useful and knowledgeable in other computer science-related fields). Now that you can somewhat understand what’s involved with computer science, let’s transition to actually talking numbers. Let’s start from the very beginning and discuss the infamous computer science starting salary. As I’ve stated earlier, one of the main reasons why people choose a computer scientist career is because of the amazing computer science starting salary that is received early on. But just what number are we talking about? 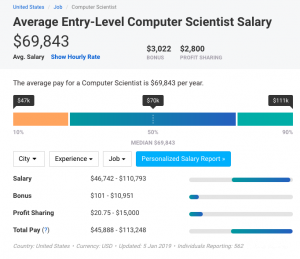 According to Payscale.com, the average computer science salary that an entry-level computer scientist can expect to receive is somewhere around the $70,000 USD mark. Dividing this number by 12 (the number of months in a year) leaves us with an awesome $5833 USD per month! When you compare this to the average salary in the USA in general (which is around $3720 USD), you can truly understand just how incredible this is. The fact that a person can finish his studies and get paid more than 1,5 times the average salary of the country is almost unheard of! It’s enough to know this fact alone to understand why so many people flock to the computer scientist specialty. Now that you have an idea of what a beginner, entry-level computer scientist makes, let’s talk about junior computer scientist jobs salary. Junior computer scientists are those people who already have some experience in their respective professions, but are not yet qualified to become senior computer scientists. These are the people that are already looking for stable, long-term jobs that would offer future career opportunities. Companies, once they know that their potential employees are already somewhat proficient in the field of computer science, are much more likely to be flexible in hiring these people. Since junior computer scientists are looking for long-term jobs, their salaries tend to increase more often. Depending on their specialization, skill level and the amount of work that they are willing to put in, they may climb into the ranks of senior computer scientists without having to stress all that much. 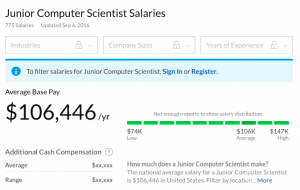 When it comes to the junior computer scientist salary, Glassdoor.com states that these people make an average of $106,446 USD per year. This turns out to be roughly $8870 USD per month. That is more than double the amount of an average salary in the US! Surely, there are a lot of different factors that come into play when we’re talking about getting a salary like this – competence and skill level, willingness to work long hours, teamworking and problem-solving skills, etc. However, if all of these things are intact, then junior computer science jobs salary is the thing to aim for! And so, we have reached the “final boss” – the senior computer scientist. Senior computer scientists are people who have dedicated their entire lives to their respective professions in the field of computer science. Whether it be web development, data analysis, working with hardware, creating games or anything in between – senior computer scientists are basically the veterans of the field. And their salaries reflect that. A lot of the time, senior computer scientists work in one, single company for a long period of time. 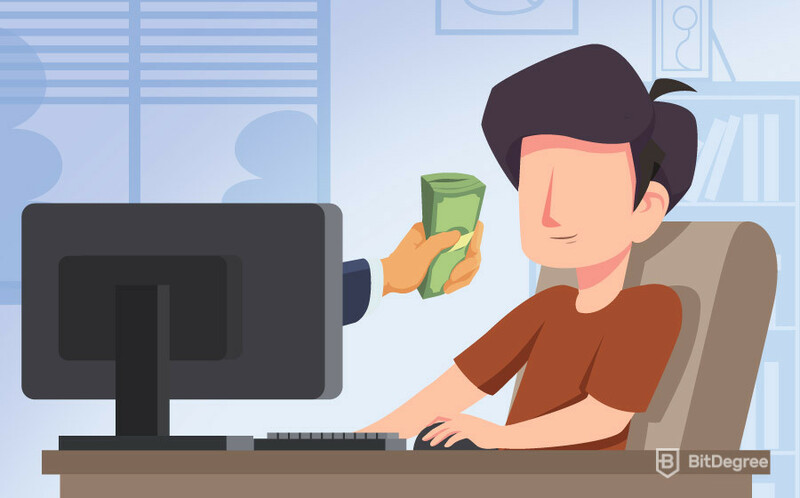 This means that they have many different situations in which their salaries may increase, be it for completing a very difficult task or project, or for sticking with the company for as long as they do. They are also usually essential members of the team – senior computer scientists are often assigned to train, teach and prepare entry-level and junior ones for the work to come. When it comes to senior computer scientists being professionals in their field, their salary truly does signify that. 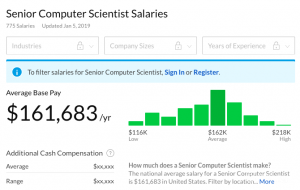 The average computer scientists salary that a senior professional can expect to receive is around $162,000 USD per year. That’s roughly $13,500 USD every single month! It’s rare to find a salary as compelling as this one, although it isn’t a given by any means. Furthermore, these numbers may vary depending on the senior computer scientist’s profession of choice. In the field of computer science, there are many different variables that determine the salary that a person with this education can expect to receive. Surely, the two most prominent of these variables are the person’s amount of experience in the field and the specific profession of choice. However, it is definitely worth noting that the salary does not represent all of the great things that come with the computer science education. Sure, it’s probably the most popular factor for why people choose to study this specialty in such numbers, but there are other factors, too. First of all, as a computer scientist, you have a vast number of possibilities to partake in personal projects. Are you specialized in web design? Great – you could create awesome designs and sell them as a form of freelancing! Or perhaps you’ve taken the game creator route? Well, how about making a game of your own, and putting in on either Steam (if it’s a bigger game) or the Android store (if it’s a mobile one)? With a specialization as broad as this one, you have a huge amount of possibilities to discover and utilize to facilitate your growth both as an individual and as an expert of the field. When it comes to the actual jobs, most of the job positions that you’ll be working in are relatively new and more often than not offered by a progressive, “freedom and responsibility” based companies. This means that you can strive to have a flexible timetable (or, in some scenarios, even work from home! ), the ability to receive bonuses, freedom to express yourself and so much more! Finally, with time, there are constantly new and interesting job positions opening up – positions that require experts in the field of computer science. The fact that you are able to work with both hardware and software will do wonders for your computer science salary. By this point, you should have a pretty good idea on both the actual computer science salary for each level of expertise and the reason WHY the computer science jobs salary is as awesome as it is. Now, with that being said, let’s have a quick recap. The field of computer science is so popular because it’s flexible, encompasses a lot of popular professions and offers an amazing computer science salary. All three tiers of people that have chosen to follow this career path (entry-level, junior and senior scientists) have some of the best salaries in the industry. A computer science salary doesn’t say everything about the job itself, however. There are many more benefits that you can receive other than the amazing computer science salary – both as an employee AND as a freelance computer scientist. All in all, it is highly unlikely that it would turn out to be a mistake if you were to choose computer science as a career path. As with anything else, however, it all ultimately depends on just how much work and effort you’re willing to put in. Well, we have reached the end of this “Computer Science Salary” tutorial. I hope that you’ve found the information provided within useful and helpful, and that you got your questions answered. If there’s one thing to take away from this tutorial, it’s that computer science isn’t just an over-inflated bubble – it’s a difficult and a lot of hard-work requiring specialty, but it truly does pay off at the end. And remember – it’s never too late to start learning! If you think you’ve got what it takes to start learning about computer science (and if similar fields and subjects interest you) – don’t hesitate! Find a course, enroll and start learning! Really good and detailed article with actual answers on questions regarding this field, additional materials and references to other sources. Information is very clear and precise because it describes all levels of the career in Computer Scientists.